Rasta asked Tracks to circulate this little story relating to the Coal Seam Gas issue. Coal Seam Gas extraction. Fracking. Heard of it? Most of us have, but do we know how it could affect coastal places, people and the animals that share these edges of Australia with us? Do you know how this industry is already changing the water, land and lives of people in the areas where it is already happening? I am going to make this brief, with the hope that you will go and see for yourself the story of CSG and fracking online where everyday people are sending out their message of despair, crying out for honesty and support from our government. And pleading for an end to an industry that doesn't seem to care for peoples well being. Three weeks ago I visited an exploratory CSG drill site at Glenuggie. A structure completely out of place among paperbark trees and rural spaciousness was supporting a heartless drill that burrowed into the rich soil there hoping to get a core sample for the CSG company Metgasco. Their goal being to understand how much gas they can get their hands on in the region. This drill site is just behind the Yuraygir national park which extends behind one of the most precious surfing c entres in Australia, and perhaps the world. The perfect point break and sanctuary of Angourie. The exploratory drill was blocked by local people for forty eight days until riot police were called in from Sydney to forcibly remove them. Women were pushed to the ground, men were assaulted and eight arrests occurred before the the violent riot police managed to clear a path for the Metgasco trucks bringing in machinery. Since when do riot police become a force for hire so that distant corporations can remove local people from their local environment? 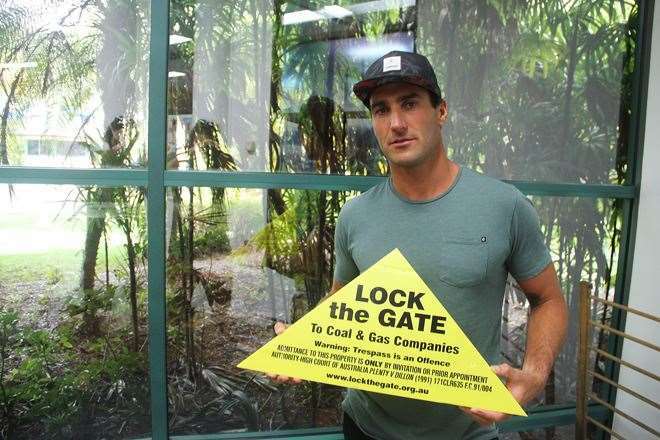 Rasta's good friend and 2012 ASP World Champion Joel Parkinson gets behind the protest. A couple of weeks later the drill was pulled from the Earth and back filled with concrete. Visions of a desperate junkie pulling a needle from their arm filled my mind as I realised this industry's attitude seems to be irrational, careless and willing to steal from anyone to get their fix. Just like a junkie. In this case the industry is willing to steal from future generations their ability to inhabit a clean, and thriving ecosystem. This industry is willing to fight dirty and send in their violent goons to intimidate everyday people. The drill, and the heartless gaze of Metgasco now moved north behind the pristine rolling hills of the northern rivers, to Kyogle and the site of another exploratory drill at Doubtful Creek. The locals there were also prepared to block the trucks and managed to slow the process of the drill breaking the Earths skin before yet again the thugs of riot police were brought in to disperse the peaceful protectors. The opposition to CSG extraction in this area is strong. Eighty seven per cent of people in the city of Lismore voted against CSG extraction and local groups such as the Knitting Nannas have sprung up in a myriad of ways to protect their local resources. Yet still the drill is in the ground and core samples are being taken as I write this. There is talk of a pipeline extending to the ocean somewhere between Byron Bay and Evans Head where a port capable of converting the gas to a liquid and sending it offshore upon massive industrial ships will need to be created. Dredging will be part of their plan. If we want to see how tragic this type of operation is we look north to Gladstone where the collapse of the fishing industry and numerous cases of water born illness have occurred since industry moved in. Coal Seam Gas extraction methods have proven to be a threat to the well being of people, water courses and wildlife. And as the ones who live here, who drink the water, breathe the air, enjoy the rivers, beaches and landscape, and who want that for our children's children it is up to us to protect it from harm.